How do I apply to join Halifax Search & Rescue? Check out the HSAR website and read the section to learn more about the mandate of our team. Register for and attend a Prospective Volunteer Information Session (held twice a year and posted on our calendar). Attendance at this session is the first and necessary step in the application process to join the HSAR team. What does Halifax Search & Rescue expect from volunteers? HSAR expects that all volunteers will demonstrate a commitment to responding, training and to events. Searches, for example, regularly take place at night, in challenging weather or inconvenient times. Motivation to learn how HSAR does things and to work as part of a team is also important: our ways of navigating, communicating, and traveling in the woods will likely be different from the way you hike, camp or hunt. New team members interested in becoming searchers are expected to participate in basic training and to learn what HSAR does overall. Opportunities to participate in advanced training are available to members once they have gained some training and experience. What kind of people join Halifax Search & Rescue? Volunteers at HSAR come from all walks of life, and each of our members brings a unique set of skills to the team. Everyone from artists and academics to police officers, engineers, paramedics and entrepreneurs join our team. We are committed to equality of race, colour, gender, religion, and sexual orientation. When can I go on a search? HSAR volunteers can respond to search and rescue operations as soon as they are formally accepted onto the team. During a search, new volunteers interested in searching are placed on a team with more experienced searchers or are assigned tasks in support roles. New volunteers interested in logistics, vehicles or other team roles are likewise placed with more experienced team members. What happens on a search? A search is started when a person is reported as overdue or missing, lost or in trouble. A rescue can also be initiated when the subject is believed to be in a known location. The passing of time lessens the chances of survival for a lost person, and weather conditions may destroy clues. Search and rescue operations are time critical and a rapid response is important. The subject may require emergency care or protection from the environment or themselves. A search is always an emergency. What kind of training can I expect from Halifax Search & Rescue? HSAR volunteers can expect a high calibre of training covering everything from map and compass, radio communication, woods survival, searching techniques, lost person behaviour, first aid, and more. Five core modules and other regular training events are scheduled year round in all weather conditions, day and night. Our team has one of the most active volunteer SAR training schedules in the country. Opportunities to work with other ground search and rescue teams in Nova Scotia also abound: we may search with other teams and train together at mock searches, workshops, and other exercises. No. Unlike other emergency organizations, ground search and rescue volunteers in Nova Scotia are not paid and do not receive honorariums. Volunteers also provide most of their own equipment and clothing. What equipment do searchers need to participate in outdoor training? For your safety and the integrity of our training exercises, HSAR requires members to carry the minimum equipment listed below during any training exercise or search event. 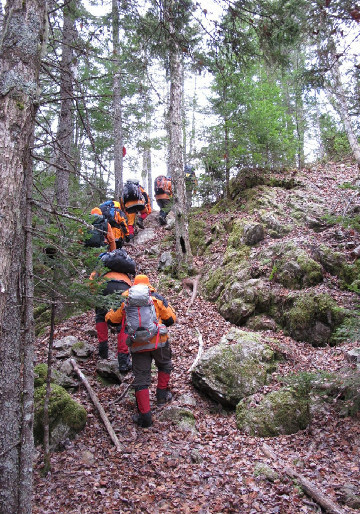 Instructors or Team Leaders will not accept volunteers to a session if they are not prepared to go in the woods. My work requires me to be away for a month or more for part of the year. Can I still apply to join? We have many members who have responsibilities that take them away from home for a month or two at a time. These include members of the Canadian Armed Forces, Coast Guard, and scientists working in the field for extended periods. It sometimes takes these volunteers longer to complete their basic training, but we welcome their energies when they are at home. Volunteers who are posted overseas with the military or who are taking parental leave can apply for a formal leave of absence from HSAR. HSAR has a K9 Committee with two certified search and rescue dogs. These dogs are are validated by the RCMP and the requirements are demanding, expensive, and time consuming. Annual expenses for the K9 team include vet insurance, equipment, maintenance of our training site/agility course, specialized training, and annual validations. Non-search dogs cannot attend searches, training exercises or meetings. Volunteers interested in becoming K9 handlers or participating in our K9 Committee’s training exercises must first become a qualified searcher by completing HSAR’s basic training modules. Potential SAR dogs and handlers must also have the approval of our Search Director and the K9 Committee Chair. Please note that we are not looking to add to our K9 team at this time. Do I need to own a vehicle? Having access to a vehicle is important as searches and training sessions take place in many different parts of HRM and occasionally in other parts of Nova Scotia. While you do not need to own your own vehicle, you should have reliable access to one.